(KCBD) - Surveyors with the National Weather Service say damage in Anton was caused by an EF1 tornado and 110 mph winds on Tuesday night. The pathway length is currently estimated at two miles by 200 yards wide, although that number may change as their investigation continues. They say it was difficult to see the tornado since it was “embedded in the line” and it was different than the classic cell of a tornado. James said this tornado may be the first they’ve captured on their radar of a “tornado debris signature." The storms, part of a “squall line” as it’s called, moved quickly through the South Plains from west to east throughout Tuesday night into Wednesday morning. Around 10:45 p.m. NWS recorded a possible tornado near Anton in Hockley County that damaged a house and threw debris into power lines. Around midnight the Hockley County Sheriff’s Office closed FM 597 between farm roads 168 and 2130, all east of Anton, because of the debris. Path Length - approximately 2 miles (may further refine this distance tomorrow, with a further investigation of locations farther north of the house that was damaged). Other Notes - Lubbock radar showed a TDS (Tornado Debris Signature) as debris, likely from the house, was lofted to around 4000 to 5000 feet above the ground. Out and about checking on the roads! Please everyone be safe tonight as weather continues to move through the area. A report also came in around 10: 55 p.m. of one driver suffering minor injuries after a semi-truck was blown off Highway 87 near O’Donnell in Lynn County, according to NWS. Two warehouses were also damaged around the area, along with some utility poles, which caused power outages in O’Donnell. Because of the outage, power was off for most of the morning. The outage impacted a generator that operates a water pump, which caused a loss in water pressure, according to a Facebook post from the City of O’Donnell. Once water flow is restored, O’Donnell will be under a boil water notice. That full post can be found here. Later in the evening, around 11: 30 p.m. NWS reported a steel building was completely destroyed about one quarter of a mile southeast of Dimmitt in Castro County. This was more than likely caused by heavy winds. There were also reports that power was out throughout Dimmitt Tuesday night into Wednesday morning. Rain and thunderstorms are not expected throughout Wednesday, but high winds could cause some damage. Sustained wind speeds are expected to stay in the 40-50 mph range, and some wind gusts could reach around 70 mph. Stay updated on the Weather section of the KCBD website for more information later today. 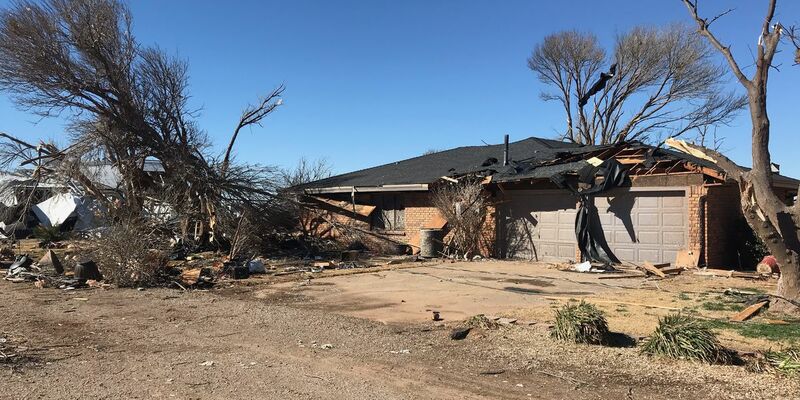 And feel free to send in any weather damage photos by emailing 11Listens@KCBD.com or tag the station on the Facebook page and Twitter profile.